This B&H Kit pairs the LiveU Solo HDMI Video/Audio Encoder with a 1-Year Cloud Bonding Plan. The Solo allows you to stream from various HDMI devices while the Bonding Plan lets you do this with a strong, consistent signal. The LRT Bonding Plan combines four connection signals—two cellular, one Wi-Fi, one Ethernet—so that any instability in one is compensated by the others. Start streaming high-quality HD video and audio with the LiveU Solo HDMI Video Encoder by connecting your camera or video device via HDMI. Leveraging LiveU's Cloud Service, you can easily broadcast to a large variety of content delivery networks, including YouTube Live, Facebook Live, Wowza, Ustream, and more, using bonded connectivity over dual cellular networks (requires separately available modems), Wi-Fi, or Ethernet. The plug-and-play functionality, combined with the power of LiveU's Reliable Transport protocol (LRT), enables a simple setup for high-quality streaming video with versatile distribution options as well as stable transmission, even when operating in remote locations. If operating remotely, use the internal battery to power the Solo for approximately three hours. Plus, the compact form factor won't bog down your production by weighing down your camera. Note: Solo video encoder only - cellular modems must be purchased separately. 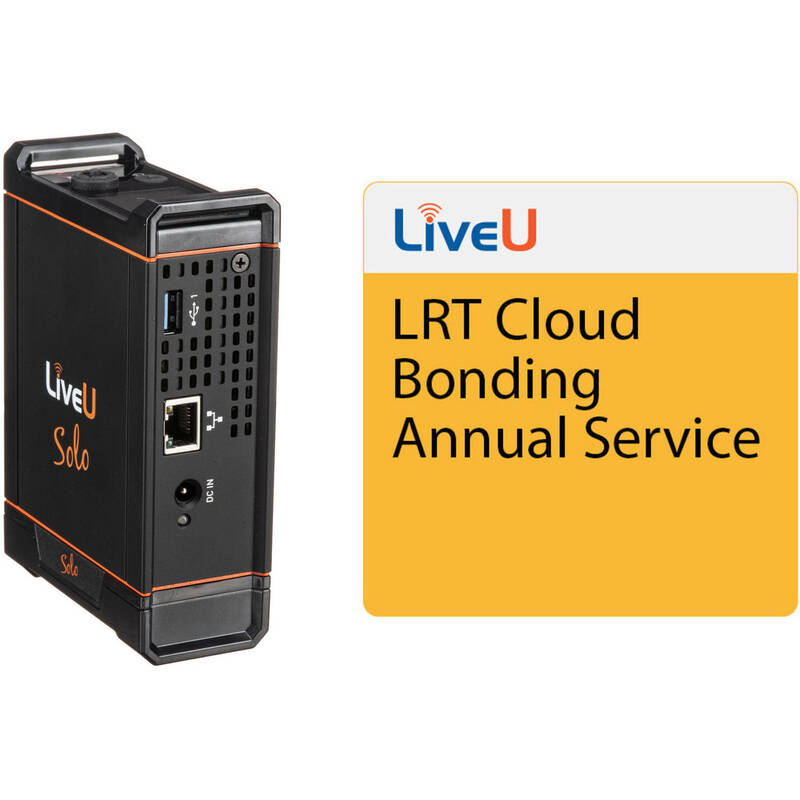 Take your Solo live streams to the next level with the LRT Cloud Bonding Annual Service from LiveU. The one-year bonding plan combines up to four signals (two cellular connections, one Wi-Fi signal, and one Ethernet signal), allowing bandwidth consistency even when one source becomes unstable. With such assurance, you can more confidently generate a high-quality live stream from just about anywhere. LiveU Reliable Transport (LRT) integrates select video delivery techniques into one protocol to offer reliable streaming with the Solo encoder. Key features of the service include packet ordering, dynamic Forward Error Correction (FEC), and adaptive bit rate encoding. LRT uses numbered packets so that the packets can be reordered when they arrive out of order. Packet Ordering is an absolute requirement with connection bonding, where data usually arrives in a different order than intended. Forward Error Correction (FEC) adds some overhead to the stream to recover lost data faster. LRT automatically varies the FEC parameters based on monitored network conditions. LRT can acknowledge large groups of packets if they all arrived. If some did not arrive, it can inform the streaming engine to resend needed data. By acknowledging large groups of packets at a time, LRT uses less overhead and latency. Unlike UDP, LRT gives complete feedback loop so the user knows that the data is arriving correctly. As the bandwidth condition changes, LRT automatically recognizes this and informs the video encoder to allow it to adapt the bit rate of video it is delivering and keep the best possible stream within the available bandwidth at any given moment. Box Dimensions (LxWxH) 8.3 x 7.25 x 5.1"